Goal: to describe on-going activities in the City of Oakland’s 10 economic redevelopment areas; to invite citizen participation. 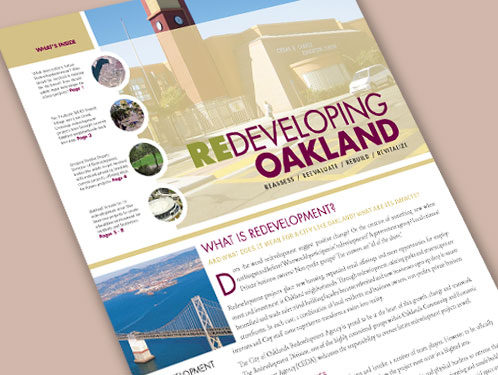 In 2003, the City of Oakland established redevelopment areas to reduce blight, encourage business investment, develop retail, and improve the overall quality of life in less affluent neighborhoods. This quarterly publication educates residents about on-going projects, and to encourage their involvement in shaping these programs.